Then I have to search though somewhere else to see if any plugins that we own are updated. I mean this is just crazy - at least at other stores we get an email when files are updated. The thought of working through all the purchases I have made here is just not amusing. Why can't our downloads be reset automatically when updates are made? Can anyone tell me which plugins have been updated? I don't think my versions of the Poseworks files have been updated, or they are lost in my Itemized Order List, or something... I know I had these working in earlier versions of 4.x. What now? I agree with Bea-- having to sift through my Itemized Orders list to try to find stuff that has changed is no good. I assume this is just a temporary limitation due to the new store, and I hope fixing it is a high priority. I haven't read everything about 4.5 yet but is it really necessary to download and install updated content like clothes or props or characters or will the previous versions still work? And what is updated - only this meta data CMS stuff which I not use or anything else then? So, let me get this right. We have to search through all our purchased items to reset DS4 to download it. Then I have to search though somewhere else to see if any plugins that we own are updated. I mean this is just crazy - at least at other stores we get an email when files are updated. The thought of working through all the purchases I have made here is just not amusing. Why can't our downloads be reset automatically when updates are made? I agree completely! So I have to go through my itemized purchase history and request resets for relevant products I've purchased since I bought DS4 Pro. Would be bad enough if I could sort my orders by date of purchase. 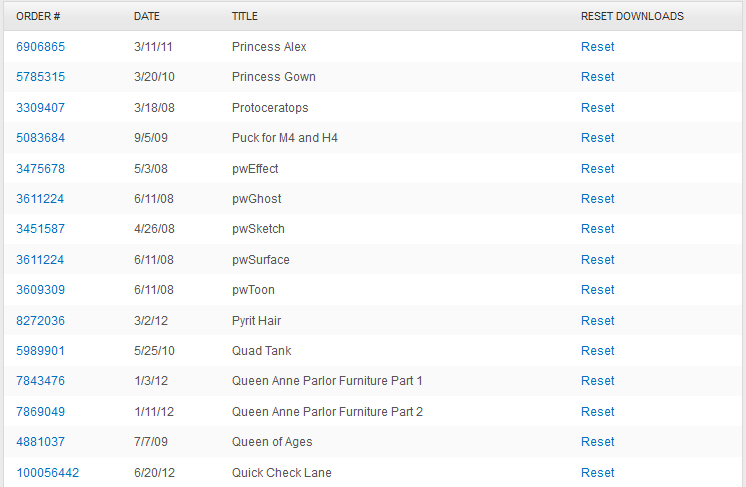 Instead, I have to go through a list that is sorted alphabetically by name! Unbelievable. Apparently the SDK has been released at the same time as DS 4.5? Must be a lot of plugin developers scrambling to update. I must say, it seems like a lot of things DAZ is doing these days have not been implemented well. 1.2 is the latest build of the Poseworks files they got updated not that long ago. Discussion of Content Updates required for DS 4.5 has been split to a separate thread. Most Genesis content was updated in March-April for an issue which wasn't being flagged in DS 4.0.3.47, but was apparent in Carrara 8.5. This issue gives a "Duplicate ID's" error when you try to use the item. Richard Haseltine has a script to patch these files so they will at least work. Beyond that, some parameter dials will show in the Parameters tab but not the Shaping or Posing tabs without the update, but they will still work. Not helpful, even if true. I had these, now I can't find them in my order history. I suppose I need to submit a help ticket.